On 8th March 2008, Malaysians made history at the ballot box. Tonight, during the extended sitting of the 12th session of the Selangor State Assembly, we witnessed history in the making. For the first time since 1960 (the year in which the Internal Security Act (ISA) was passed), a motion against the ISA and for the release of state assemblyman Manoharan (Kota Alam Shah) and other political detainees was moved in a Malaysian legislature, debated and passed! A step for Pakatan Rakyat, a giant leap for human rights in Malaysia. Posted by elizabethwong in Current Affairs, Democracy, Malaysia, Note2Self, Politics, Race Relations. Hands up, everyone who had once dreamt of being a doctor, to help society, cure diseases, world peace etc. Today, a 17 year old from my state constituency Bukit Lanjan, despite having 12 As, was told he couldn’t qualify a JPA scholarship, evidently based on his ethnicity. He too dreams of being a doctor and to be of service to society. And despite the recent announcement by the Ministry of Education that all those 9As and above will be recipients, our young friend still has not received an new offer from MoE. He is not the only one out there. The signals are clear for BN that it needs to reform after the massive vote of no-confidence especially in Peninsular Malaysia. Alas, there are none so blind as those who will not see. Tun Dr. Mahathir’s decision to leave Umno today is indicative of Umno’s worsening crisis, where leaders continue to bicker and fight, while the welfare of ordinary Malaysians are increasingly neglected. 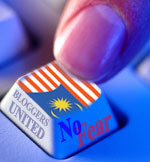 The internal problems of Umno are clearly deteriorating beyond any hope of recovery. Nonetheless, we must avoid being trapped by personal agendas to replace weak leaders with corrupt ones. In view of the worsening crisis, any and all Malaysians of conscience who are concerned for the continued stability, prosperity or unity of the country are invited to join KeADILan and Pakatan Rakyat and pursue our shared ideals for a better, united Malaysia. Keputusan Tun Dr. Mahathir untuk keluar dari Umno hari ini mencerminkan krisis Umno yang kian merosot, di mana pemimpin saling berebut dan bercakaran, manakala rakyat semakin tidak terbela. Masalah dalaman Umno semakin parah dan jelas tiada harapan untuk pulih. Walaubagaimanapun, kita mesti mengelakkan dari terperangkap dengan agenda peribadi untuk menggantikan pemimpin yang lemah dengan pemimpin yang rasuah. Memandangkan masalah dalaman Umno yang semakin merudum, semua rakyat Malaysia yang prihatin dengan kestabilan, kemajuan dan perpaduan masa depan negara dijemput menyertai KeADILan dan Pakatan Rakyat untuk merealisasikan visi bersama untuk bersatu demi memulihkan Malaysia. I spoke to Petra briefly on Monday night, just before boarding the plane, to express my solidarity and to apologise for not being able to be in court on Tuesday. He did not indicate at anytime that he would forgo bail and sit it out until his trial. So imagine the stir at the Dubai travel fair when some Malaysians received SMS about this. After the political tsunami of 8 March, one imagines the Government has learnt its lesson. Guess not .”Perjuangan belum selesai“. The Sedition Act should have been abolished decades ago. I recall having written, in some of SUARAM’s past annual human rights reports, that it is kept to stifle oppositional and dissident views. So long as it remains, our relative and limited freedoms are illusory.